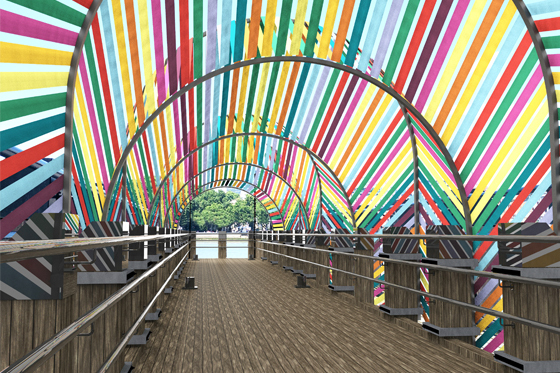 At Design Junction during the London Design Festival, the city of Saint-Etienne will showcase a gateway of steel and ribbons to promote inclusion in design. This gateway will travel to Paris and then to Saint Etienne where it will welcome visitors to the Biennale next spring, from March 21-April 22, 2019. The future will be about designing systems, not stuff. In an era of individualism, design will find better solutions for living together in multi-cultural, multi-generational, multi-attitudinal societies not based on age, race or gender but on speeds, interests and points of view. Designing for the future means designing with inclusion, from a table to a wheelchair, a telephone to a town so that our world looks more like everyone and less like no-one. The Saint-Etienne Design Biennale is a gateway to a more inclusive future. With roots in the heart of France that extend internationally, this unique event is open to all: the local population and the global design community. Focused on the most innovative and challenging design futures and research, it invites the audience to interact with and experience the processes of design. The Saint-Etienne Design Biennale 2019 will be curated by Lisa White, a French American, currently head of Lifestyle & Interiors for WGSN, the international trend forecasting service. For the Design Junction exhibition during the London Design Festival 2018, she and designer François Dumas conceived and created the Gateway to Inclusion as a portal to the larger Biennale, taking place in the spring of 2019. The Saint-Etienne International Design Biennale, located in the heart of the city at the Cité du Design, is supported by important public and institutional partners, including the City of Saint-Étienne, Saint-Étienne Métropole, the Auvergne Rhône-Alpes region, and the French Ministry of Culture. WGSN (www.wgsn.com) is the world’s leading trend authority for creative thinkers in over 94 countries. Our services cover consumer insights, fashion and lifestyle forecasting, data analytics, crowd-sourced design validation and expert advisory services. We help drive our customers to greater success. Together, we create Tomorrow. WGSN is an Ascential company. Coloro is a truly universal, intelligent and logical color system that allows more accurate and faster communication throughout the color process and manufacturing chain. SALES via retail and ecommerce strategy and analytics products from One Click Retail, Clavis Insight, Brand View and PlanetRetail RNG, the world’s premier payments and FinTech congress Money20/20, global retail industry summit World Retail Congress and Retail Week.